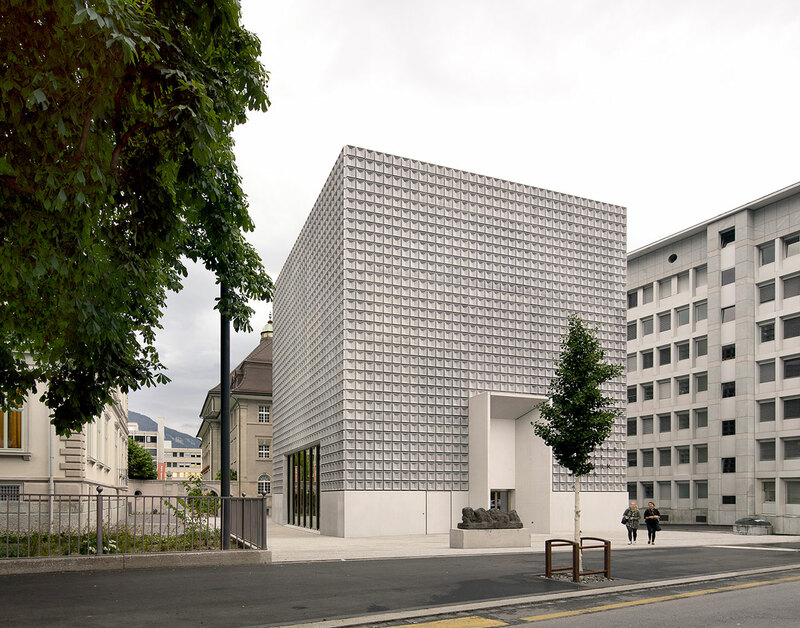 The development of the new extension of the BKM - Bündner Kunstmuseum, the fine arts museum in Chur, Switzerland, began in 2011 with an international architectural competition. 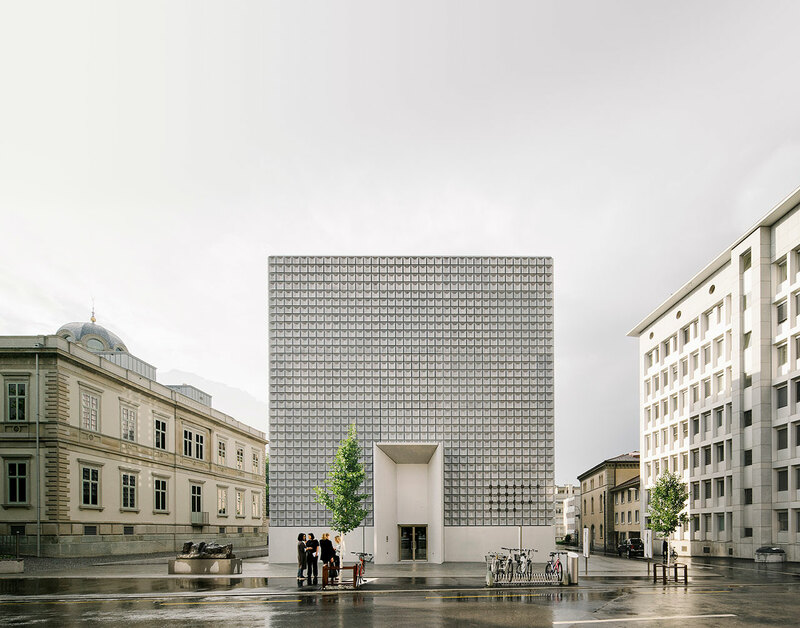 The proposal that finally outshone the competition’s rivalry was submitted by Barcelona-based, Estudio Barozzi/Veiga and today that finished work proudly stands beside the Palladian, Villa Planta, a testament to the fact that two buildings don't have to be identical in order to mirror each other beautifully. Villa Planta, a grand neoclassical structure, was completed in 1875 by architect, Johannes Ludwig, and is listed as a historic monument today. Extremely ornate in its design, it nonverbally speaks of the times during which it was constructed, when opulence and ornamentation were the order of the day. Nevertheless, the basic elements of its cubed design, i.e. its symmetrical portico and supporting columns and mirroring sculptural décor elements on either side are actually rather modern in the sense that they are a case of simple repetition on a basic geometric form. This simple form, the cube, is obviously the element of the Villa's design that made an impression on the architectural team, led by project leader, Katrin Baumgarten, when dreaming up the new extension. Unabashedly clean-cut in design, it takes the cube to another level, supplanting the ornamental façade of the Villa with a straightforward, multi-square design façade that embraces the building on all sides. This building also speaks of the times in which it was constructed, when no restraint and subtle detailing seem to be the sought-after order of the day. But the new extension plays homage to Villa Planta in more ways than one, evident as soon as one steps inside where a floor to ceiling wall of windows perfectly frames the Villa, highlighting it as the artwork that it really is. 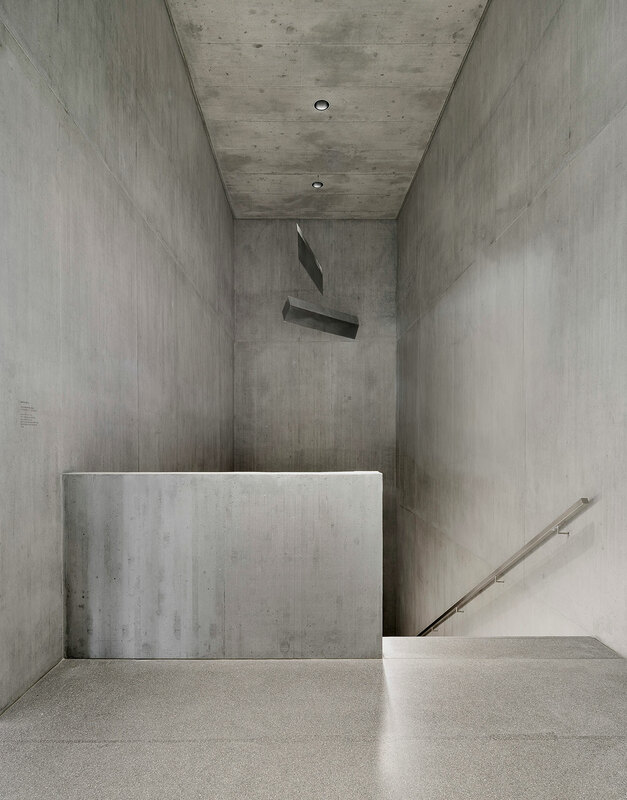 Plentiful natural daylight floods the minimally ascribed space, which features the laid-bare, stripped-back cement and marble environment we've come to associate with art museums worldwide which also allows the artworks to take center stage. In fact, the most ornamental element within the new extension is the reception hall's metal ceiling grid in that its repetitive, geometric design also seems to pay homage to the shape of a cube, or a square. 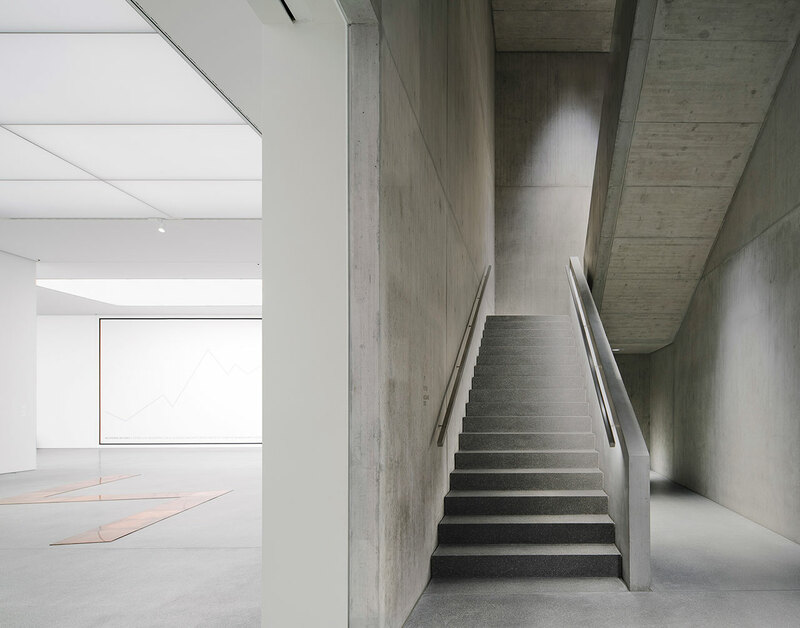 The main exhibition spaces of the new building are housed underground, with only public-access spaces situated above ground. 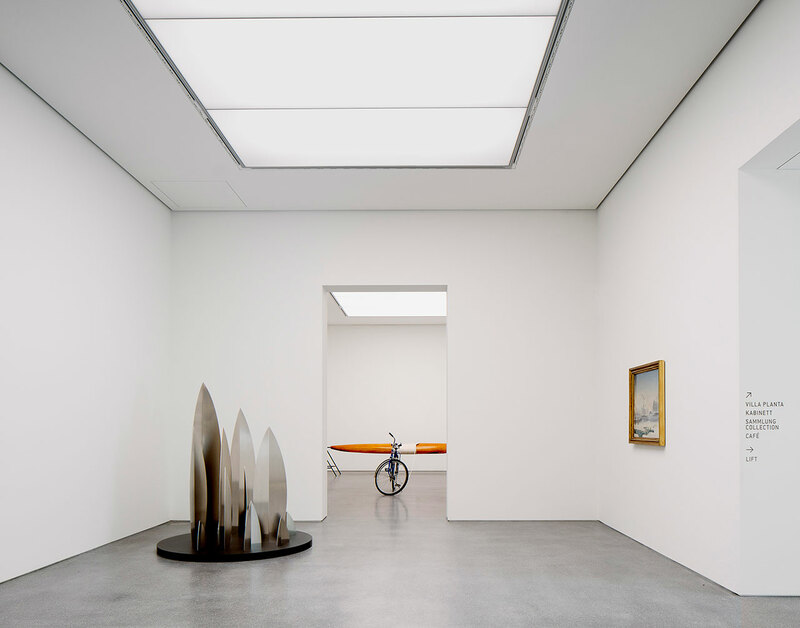 Perhaps one of the most intriguing elements in the construction of the museum's extension project however is the fact that the main exhibition spaces are housed underground (only public access spaces are above ground). This was done to utilize the limited urban environment between the two buildings and encourage communications with the surrounding structures. 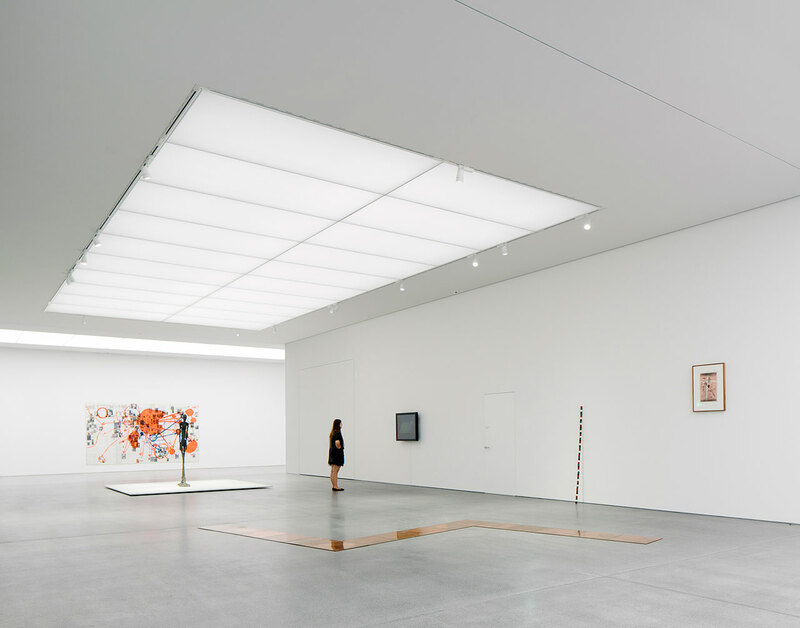 As a result, when wandering about the brightly lit exhibitions underground it becomes more than apparent that the two buildings work together as a single whole, continuously dialoguing, ebbing and flowing along with the museum's visitors. 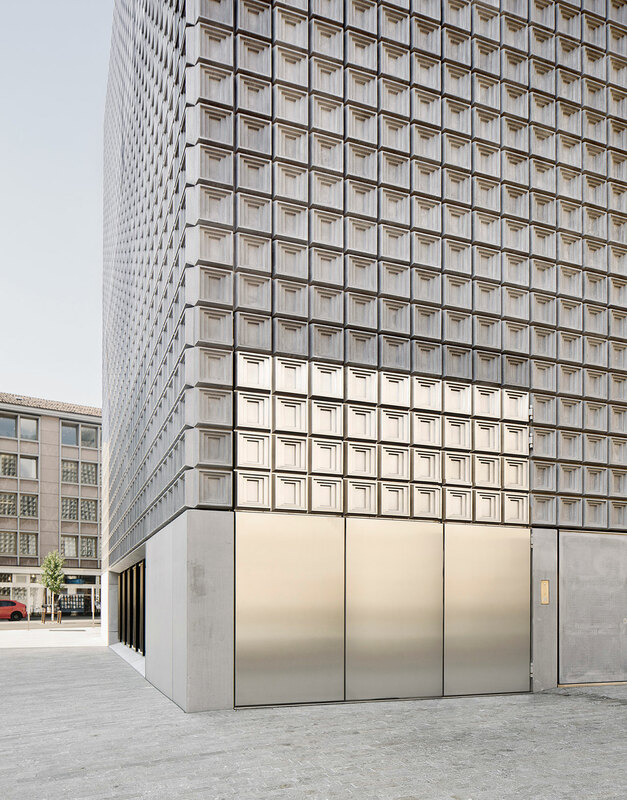 Facade © Estudio Barozzi Veiga.